If you like good value you'll love Porto as it's a smaller, cheaper version of Lisbon, Portugal and very similar to Chiang Mai in a sense. I loved Lisbon so much that I honestly wasn't even going to go up north to check out Porto but I'm glad I did. People said it would be a smaller, more chilled out city but what I found was great food, super cheap drinks, and a more authentic Portugese experience. If you like Lisbon, but wish it was smaller, even cheaper, or was more traditionally Portugese, Porto might be the place for you. 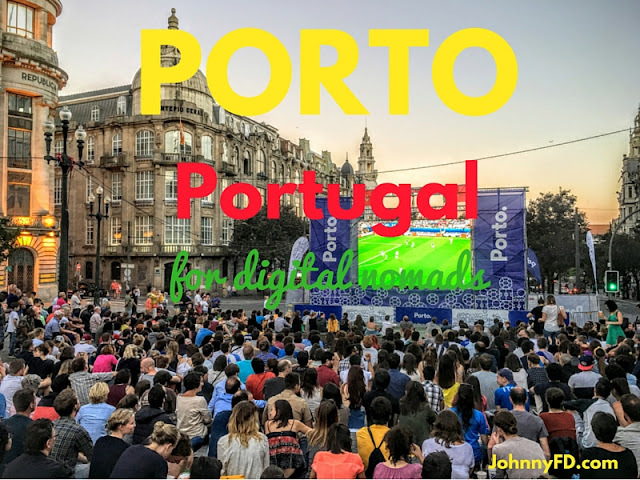 In this post I'm going to talk about the pros and cons of Porto as a digital nomad hotspot, the pros and cons of Porto vs. Lisbon as well as which I believe will become the next Chiang Mai and why. Coming from Lisbon you can just take an easy 3.5 hour train ride to Porto for around $28. They have spotty wifi on board, but my 4G (MEO) seemed to work most of the time. Their dining cart is a good place to hang but bring your own food on board as they only have cold pastries. The best thing about Porto is their own international airport which if I knew about earlier, I would have planned to fly out of instead of coming back to Lisbon. You can find direct flights to over 60 destinations including Amsterdam, Spain, Berlin, Italy, France, UK, Belgium, Denmark, Ireland, Brazil, Toronto, Warsaw, and Switzerland. Another reason to fly from Porto is they have a ton of flights with Ryanair which is a super low cost carrier with the best online booking system and customer service of any airline I've ever flown, period. Air Asia can learn a thing or two from Ryanair's customer service and lenient refund/change policies. Once you get to Porto, you can call an Uber to take you into the city center. You may have to walk across the street as the Taxi mafia mess with them inside the train station, and they don't arrive as quickly as they do in Lisbon as their are fewer, but I'd still rather support them than deal with old school taxi drivers anyday. Travel Tip: Before booking your flights to or from Portugal, take a look at both flights to/from Porto and Lisbon to see which one is a better value and time. I was super surprised when my Uber driver dropped me off at a main square in Porto as I didn't realize my hostel was in such a great location. I originally wanted to stay at The Gallery Hostel as I've heard it's a nice setup with a social atmosphere but since they were completely full, I had to go with my second choice of The Wine Hostel in Porto which ended up being a great place to stay. Their location was an A+ but skip their breakfast, dinners and group activities. It happened to be a decently social hostel on a few nights but other nights the lounge area was completely empty and I accidently signed up for a "group" dinner that ended up being only me. Luckily, wherever you end up staying in Porto you'll most likely be pretty central as the city is small. What I liked about the Wine Hostel is the fact that it was directly upstairs from a group of bars that offered $1 beers, sangrias, ciders and shots! I happened to be there during the European Football/Soccer Championship and during the match when Portugal beat Croatia so it was a ton of fun sitting around and watching the game with people going wild. Travel Tip: Stay within walking distance of the city center as unlike Lisbon, there are fewer Ubers and since the city is small, most places are walkable. Celebrating a goal during the EU football match. One of the best things about Porto is the amazing good for less than $10. You can argue that overall Lisbon has more choices and better restaurants if you included the higher end ones and michelin star chefs but as far as cheap eats, Porto wins hands down. First off they have the infamous Porto sandwich, the Francesinha which is bread, ham, two different types of sausage, and a steak, covered in cheese, tomato beer sauce, all served with french fries. You can also get an egg on top which I did. The craziest thing about the Francesinha is the fact that I've regularly seen groups of skinny Portuguese girls eating them for dinner. You would think it was something out of a Man v. Food challenge but it's actually a staple dish in Porto. 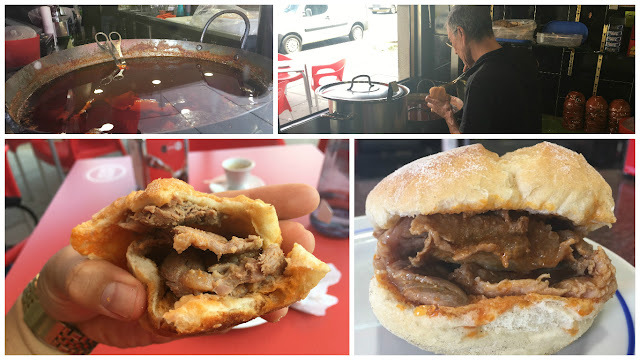 Another sandwich you have to try is the Bifana which is like the Portuguese version of a french dip. I got lucky and happened to stop by an amazing place directly across from the train station in Porto. I later tried a few more places including Conga which was recommended by tour guides as being the best, and none of them compared to the tenderness or deliciousness of O Astro. For around $1.15 the Bifana at O Asto is a super tasty sandwich made from tender pork that has been stewing in a slightly spicy sauce that just begs you to have a $1.15 beer and another sandwich when you're done. If you plan on taking the train from Lisbon to Porto, I would plan on arriving after 2pm when the shop opens and walking directly out and to the left of the train station where you'll see their sign. The other 1 euro ($1.15) sandwich you can get, is their breaded pork cutlet which I believe may also be called some type of Bifana. The three main things I recommend to do in Porto are to go on a free walking tour, go to the wine cellars on the other side of the bridge, then leave Porto and take a day trip to the Douro Valley wine region. The best free walking tour in Porto and possibly the best one I've taken anywhere in the world was the only by a local Portuguese woman named Eugenia. Just search Tripadvisor for "free walking tour Porto" and you'll find her website and a hundred raving reviews. You have to email her 24 hours in advance and confirm multiple times which is a bit of a pain, but once you get on the tour you'll see it's worth it. Most guides get tipped around 5 euro a person but she was getting bit more as she was so good. Aside from that, spend a day walking across the bridge and going to 2-3 wine cellars. You don't need to book a tour to go as each cellar has their own tours individually but check their websites to see what time their English speaking tours happen as when I got there, I barely made it to the last one. Popular ones to check out are Sandeman, Taylor's, and Graham's which were all done by the time I got there. Luckily I arrived just in time for the tour with Ferreira and although it was a big group and seemed very impersonal, it was cool seeing where the wine was stored and was worth the $9 including three glasses of Port wine. Lastly, I would leave Porto for the day and go to the Douro Wine Valley and visit some wineries there. You can either book a tour that'll take you there and back or you can just take a train there and do the tour on your own. Either way it'll be nice to get out of the city and see the region as Porto although beautiful is a bit small and there isn't a ton to do. 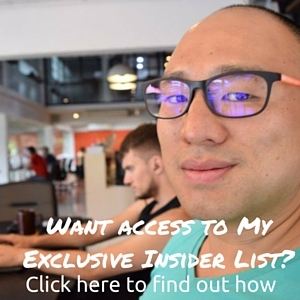 I really wanted to like Porto as it has the makings of the next Chiang Mai, it's a small city with a good coworking space, friendly people, good food and a low cost of living. It even has it's own international airport which flies direct to a bunch of countries. The only downsides is that it's smaller than Lisbon so you may get bored being here too long, especially during the winter where it's colder than Lisbon and tourism is down. I went to a really good coworking space in Porto called Porto I/O and loved it. Great setup, friendly people and pretty social as well. 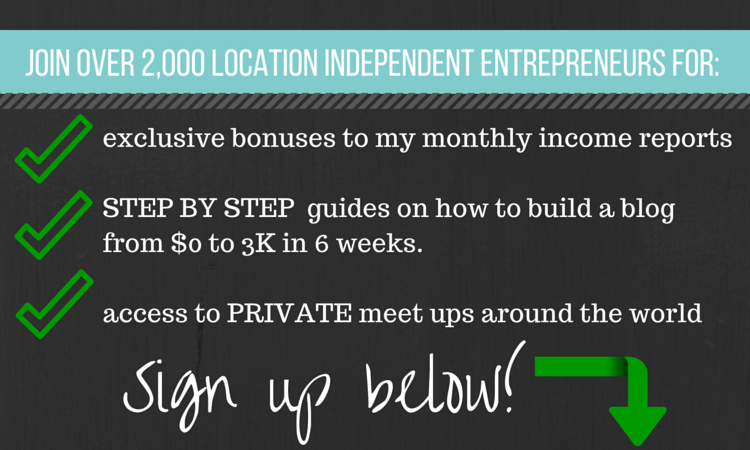 They have weekly meetups which is great for networking and meeting new friends, the only downside is that it's small. If you're a couple or a small team and want to base yourself somewhere cheap to live, Porto is a great place especially in the summer. However, since Lisbon is an option and still very affordable, I'd have to recommend most nomads go there first then visit Porto later on to see if they like it. 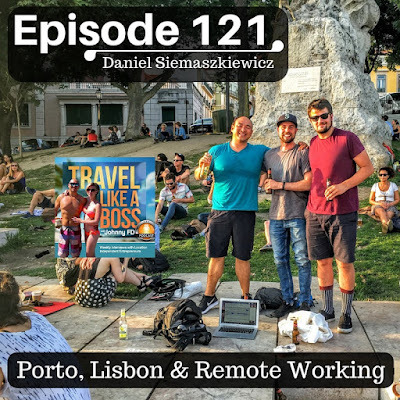 Take a listen to my Porto vs. Lisbon podcast for some of the pros and cons of living in each city. I had a great time in Porto especially since the EU Football championships were happening the same time I was in town and Portugal was winning. I met some really cool people and had a blast drinking $1.13 beers and wine. I would definitely go back there again and it wouldn't be the worst place to base yourself out of especially if you're on a tight budget. The only reason why I wouldn't recommend it as a nomad hot spot is just because there aren't enough people there. You might get lucky and meet a couple cool people that happen to be in town or if you go there with some friends you'll be okay as well, but Lisbon really is an incredible place and in my opinion is worth the little bit extra for rent, as it'll still be 1/2 the price of other cities in Europe and 1/4 of the price of big cities in the U.S.
A few photos from Porto. See more on my instagram. If you haven't already, read my full guide on Lisbon, Portugal on my blog. 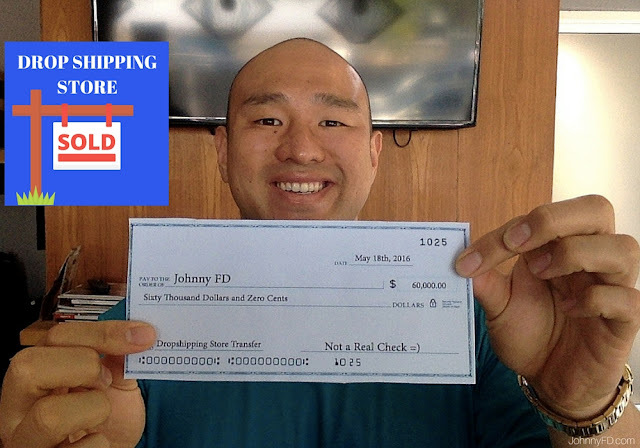 Hey Johnny, great post! I just started listening to your podcast and just got one of your courses. I live in the south of Spain so I will definitely have to give Porto and Lisbon a visit! Keep providing great value with your content bro! Hey awesome! Really glad you enjoy both the podcasts and the blog posts! If you like Spain you're going to love Portugal! Let me know how you find it! Ha, that's the first time I've ever known anyone to say anything positive about Ryanair! I've heard Ryanair used to be terrible but they've stepped up their game which to me is what's important, when a company tries to be better. Even though my flight was 2.5 hours delayed because France had an air traffic control strike, the customer service with Ryanair was excellent. Their $45 airport check in penality is crazy especially since they don't mention it clearly when you book online that you have to check in online, but aside from that they were great, and luckily I always check in online. Yup they're on of those no frills, not even drinking water is included airlines. But their online ordering system is super smooth, and they do free cancellations and changes and changes within 24 hours of booking which most other airlines don't. We're headed to Porto for 6 weeks Nov 5. Can't wait to have those sandwiches!